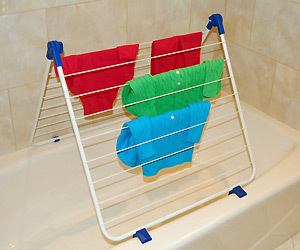 This Bathtub Drying Rack from Better Housewares is amazing in so many ways. It fits beautifully over the bathtub in angled position or lays flat. After bath, you can hang clothes on it for drying. Since it is over bathtub all dripping water goes into tub, so no extra mess.